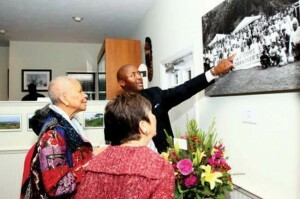 WELL-GROUNDED – Artist Mark Person points to a photograph of his family at Zion Union Heritage Museum. Next, Mark pointed out a picture of a wooden house. “I used to sit on that porch with my grandfather as a child,” he said. “He encouraged me to dream.” Next to that photo was the newly erected sculpture of Martin Luther King in Washington: Dr. King, arising out of the massive stone, his deep voice echoing the biblical witness, the overcoming of oppression, that can emanate out of one person’s dream. I am particularly struck by a large photograph of a family, a very large family of many generations. 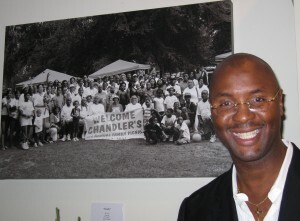 They are proudly holding a banner: “Chandler Family Reunion.” I learn from Mark that he is from a family of 10. “There’s my older sister; she believed in me and helped me get my first job. In the front row are my mother and her sisters.” Mark has a special way of releasing the image to a broader consciousness. Metaphor speaks to the heart as well as to the mind. Mark’s family becomes my equally large Italian-American family and from there we become one family embracing all humankind. A large central wall of the museum has three pieces. In the middle I am fixed on a foreboding stark stone structure with bars over the entrance and the words MART and underneath “OLD SLAVE MART MUSEUM.” To the left is a photo of a St. Francis sculpture and to the right a statue of Christ in the midst of tall flowing reeds, arms outstretched in a welcome. While I am arrested by this metaphor of human suffering, I take refuge on either side from Francis, the saint of peace and Jesus, the man of compassion. Mark Person is a multi-faceted artist. He is involved in publishing and has created an upcoming book, Finding Peace through Photography. He also founded Middleman Productions, to manage and promote top recording artists. From Jan. 30 through Feb. 17, he will have another exhibit at the Cultural Center of Cape Cod in Yarmouth, with an opening Feb. 2. Two concerts of his recording artists will also take place there, on Feb. 9 and 16. You will be richly rewarded for availing yourself of the time to visit the museum at 276 North St. in Hyannis (508-790-9466). 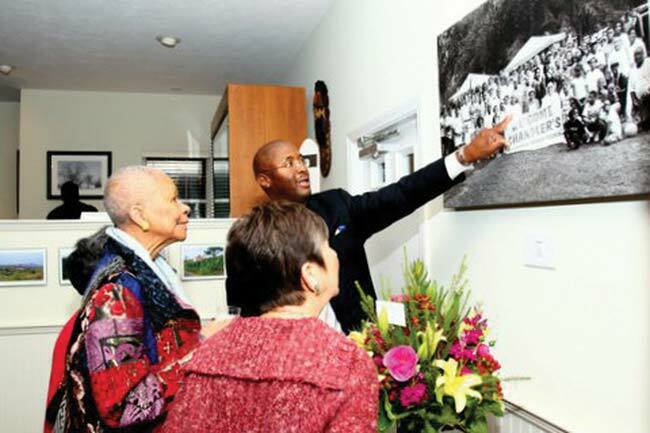 “Staying Grounded: The Photography of Mark Person” will be on exhibit through Feb. 28.